Awesome to know that Americans helping Americans is what keep this country is the best in the world Thanks to our military and Harley-Davidson dealers owners. 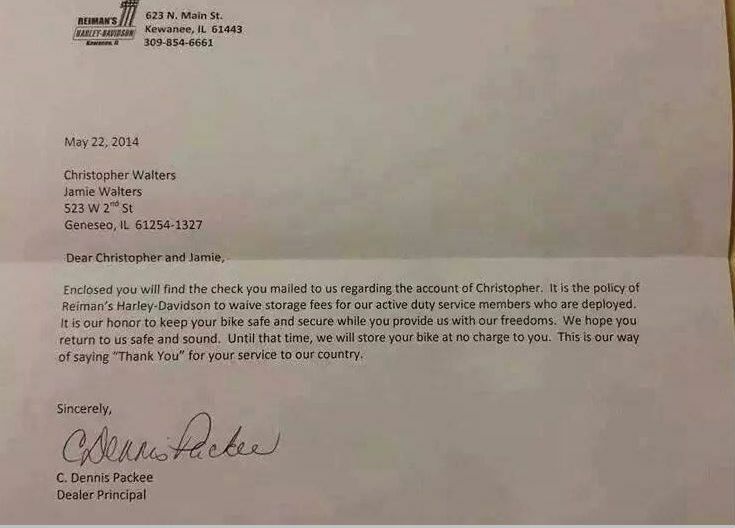 A humble Harley-Davidson dealership owner named Dennis Packee is going viral for a letter he wrote to a soldier’s wife. The soldier, named Christopher Walters, left his motorcycle in some rented space at Reiman’s Harley-Davidson before being deployed overseas. Christopher’s wife, Jaime, was supposed to stay on top of payments for the storage space while he was gone, but she recently fell behind. In her letter, Jamie explained why the payment was late. And when Dennis read her reason, he refused to take her money. He knew that she needed it more than him. Decades ago, Dennis was almost drafted into the Vietnam War. But when he had his medical examiner, he was discharged. Since then, he has understood the sacrifices the men and women who serve America make on a regular basis. And Dennis has always been looking for creative ways to give back. When he saw Jamie’s letter and late payment, he knew this was one of those opportunities. Accepting Jamie’s money was not only a problem for Dennis, it was against a policy Dennis instituted more than 18 years ago. He wrote back to Jamie, returning her money, and explaining the dealership policy. Because Dennis doesn’t even use Facebook, he didn’t know how it worked. But the attention not only shocked him but increased his love for America. This is the American we grew up in, the people who make the this the greatest country. God Bless you Harley- Davison for going the extra mile. God Bless our troops!! God Bless the USA! ← JUST IN!! Jeff Sessions Makes MAJOR Announcement, Obama Will Not Like This!